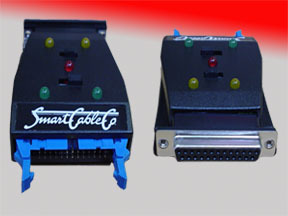 The SC817 is a DB25 to DB25 intelligent serial interface solution that instantly makes the right interconnection amoung thousands of possible RS-232 cable configurations. The Smart Cable's patented logic analyzes the interfaces and determines the appropriate connection for you. The SC817 matches up all the data and handshake control lines automatically, with a flick of the switch!